The railroad system serving Amherst was expanded again in 1887 and a street railway line from Northampton and Hadley was completed along Northampton Road and Pleasant Street by 1900. The electric trolley from Holyoke and South Hadley to Amherst was completed by 1905. East Village, UMASS, and Sunderland were also connected by streetcar lines in that period. Telegraph communication with the outside world was established in 1861 -- the first message from Amherst was sent on Dec. 9, 1861. In the fall of 1895, a local telephone exchange was established in Amherst, with some forty subscribers. As early as the days of stage-coaching the town was supplied with an express service; the character of this service was changed when the first railway line was completed through the town, but has been continued, by different companies, up to the present time. A passenger transfer service between the depots and the Amherst house has been in operation for many years. The first public laundry was established in Amherst in the 1870s by G. W. Arms. 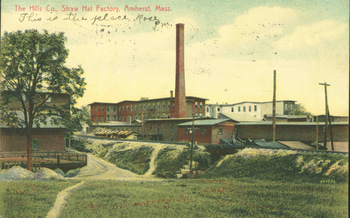 Hills’ East Amherst-based straw and palm leaf hat industry was the major employer in Amherst. By 1872 Hills’ factory was said “to be the largest producer of palm leaf hats in America”. After Hills’ death the factory was sold to H. D. Fearing and a second factory was built across the tracks from the first. The village of Cushman’s economy declined as the Roberts paper mills closed in 1894 and the last Cushman mill closed in 1902. Local agriculture, in contrast, was boosted by the establishment of the Massachusetts Agricultural College as a result of the Federal Morrill Land Grant of 1862. Twenty years later the State Agricultural Station was established. Amherst by then was a leading agricultural town in the county, producing quantities of butter, eggs, potatoes, and Indian corn. Research at the Massachusetts Agricultural College in apple growing lead to the creation of orchards in South Amherst (1910-1920). "Amherst Central Business District." National Register of Historic Places Registration Form. National Park Service. 1989. Available at the Jones Library Special Collections. Carpenter, Edward Wilton and Charles Frederick Morehouse. History of the Town of Amherst, Massachusetts. Amherst, Mass. 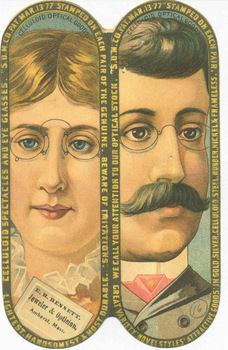 : Press of Carpenter & Morehouse, 1896. 470. Available at the Jones Library or on GoogleBooks.